We have DIY step-by-step infographics and free printables so you never have to forget another task! A Candy Girl just has to be on top of everything—school, family, travel, and more! If there’s too much on your plate, noting it down is an easy and effective way to remember it. But jotting it down on your phone just isn’t the same thing as getting creative and coming up with your own DIY project. Here are 5 simple projects that will help you stay on top of your game while having fun exploring your artistic side. Scenario: Your mom complains about you having too many shoes. She just forgets that she's the one who buys them for you! Here’s a way to solve that situation. Look for those eco bags lying around the house and turn them into shoe organizers! If she doesn’t see your clutter, she won’t bug you about it. It's also great for P.E. days or school events, when you tend to forget to bring your running shoes or dressy heels during your morning rush. PRO TIP: Instead of photos, you can also print out cute labels on your Canon PIXMA printer, turn them into stencils and paint them over your eco bags! If you’ve ever wanted to take note of what you’ve worn so you don’t end up repeating, this is for you. Better yet, why don’t you take the extra step and plan ahead? Think of all the minutes you’ll save, so you’ll end up being able to sleep longer! You’ll thank us later. PRO TIP: You may click here to download the photo templates we used and print it on your Canon Selphy printer or click here to download a PDF template that you can edit on your laptop and print on your Canon PIXMA printer! Life gets hectic sometimes. Wouldn’t it be nice to find a way to neatly plan things out for school, friends, family, and your other activities? We have the solution for you! Build a simple command center from your very own study table. You’ll have all those areas handled before you know it! PRO TIP: You can click the links to download the photo templates we used for the Note Dispenser, In and Out Message Pockets, and Activity Labels so you can print them on your Canon Selphy printer. Click here to download all of these in an editable PDF template so you can print them on your Canon PIXMA printer. The best part about having a locker is never having to lug those heavy books around. The second best part? Dressing it up! If you want an artsy way to plan your days, this is it! PRO TIP: Click here to download the photo templates we used and print them on your Canon Selphy printer. If you have a bigger locker space, you can also buy a small whiteboard and print out these labels on your Canon PIXMA printer for the rest of the week so you can freely write down your tasks under each weekday. Preserve your memories through your very own travel binder. It’s a great way to back up your photos—what else is safer than having a hard copy with you? Plus, you’ll have something to show your friends and relatives. Get your creative juices flowing as you relive the memories of your most recent trips. PRO TIP: Save time by layouting your photos on an 8.5x11 inchcanvass on Photoshop and printing all your photos at once using the Canon PIXMA printer. Stop hitting the 'Forgot password' button already! While it's quite impossible to memorize all your passwords (because admit it, you have A TON of social media accounts), it's also risky to store them on a random note on your phone or write them on a Post-It. So here's an easy (and sneaky) DIY trick you can do to store your passwords without the risk of getting hacked! PRO TIP: Make sure you print the first page, and insert the output face up with the header facing you, to get an inverted second page! This way, it's easier to see your passwords when you flip your secret password keeper! Click here to download the PDF templates we used and print them on your Canon PIXMA printer. Looking for printers to get you started on your organization projects? 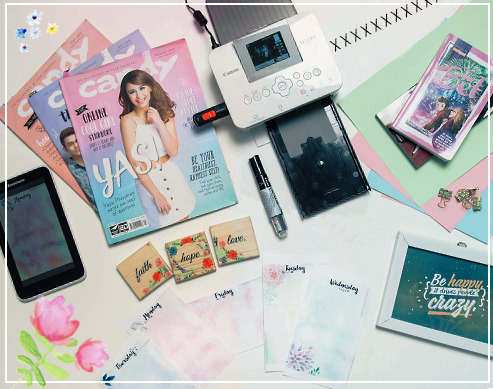 The Canon Selphy Compact Printer and the Canon PIXMA Printer are great options for a crafter like you! To learn more craft projects that you can make with Canon Printers, click here! Visit www.canon.com.ph now! This article was created by Summit StoryLabs in partnership with Canon.